The biggest difference is that Elder Scrolls Online is an MMO and Skyrim is a single player RPG. In Skyrim, you can play without an internet connection. You just create a character, and explore a world where you are the only real player. On the other hand, Elder Scrolls Online (as the name hints) is an online game and will require an internet connection in order to start playing. After character creation you will be placed in the world with many other players. They are real like you and you can interact with them, chat and invite to your groups. You can also trade with them and explore the world together; completing missions and fighting battles very much like Skyrim. The two games take place in a different time. All events in Elder Scrolls Online happen in the Second Era, which is about 1000 years before the events of Skyrim. The general political situation is also very different. Some people call ESO “Skyrim Online” but this is misleading. Although Skyrim is in ESO it is as one of 9 provinces in Tamriel that you can explore. You can also visit other familiar territories: Cyrodiil, Morrowind, Daggerfall and others. 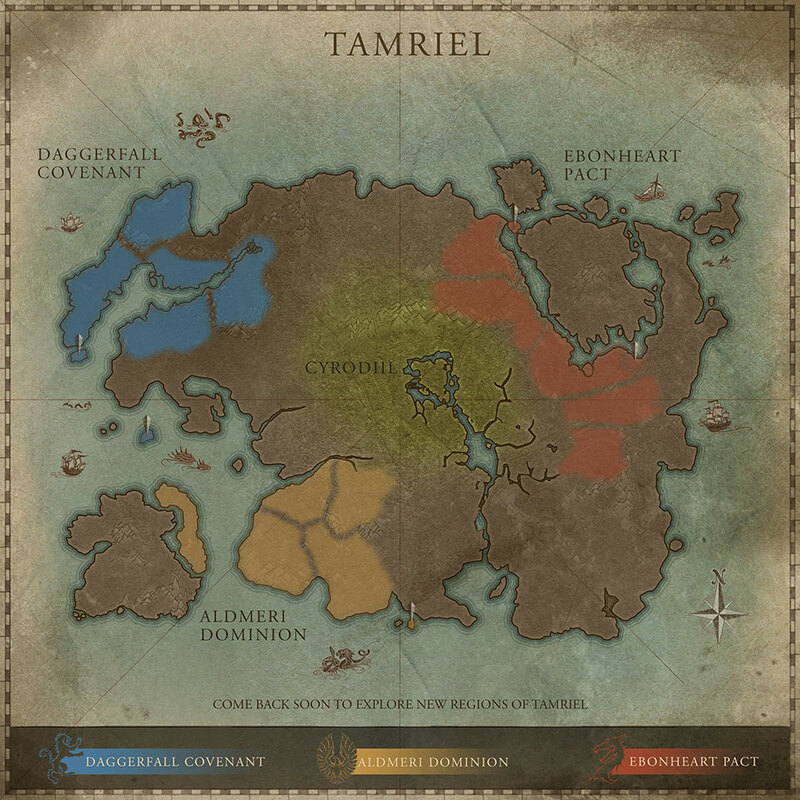 As it is the whole of Tamriel, the size of the world in ESO is much bigger than in Skyrim. However, not all territories will be available after the game launch, but they are expected to be added in post-launch expansions. The most important aspect of Skyrim gameplay is the dragons. You are the dragonborn, and you can absorb dragon souls and learn dragon shouts. But unfortunately you will not meet Dragons in TESO. The game takes place 1000 years before Skyrim and the dragons are not in the world of Nirn at that time. But who knows, maybe this will be changed in content updates. Skyrim has great customization options and allows you to create a very personalized character. In the same way, Elder Scrolls Online also offers a lot of customization options. The general system of creating a unique appearance is very similar to what you see in Skyrim. With very in-depth adjustments that will allow you to make your character truly unique. All single player TES games are based on the concept of an open world. You are free to go where you want, and, you are free to do what you want. TESO will also give you a lot of freedom, with the only difference being that you can explore the world with your friends. Skyrim has a very traditional economy similar to many other RPG games. You loot items from your enemies and sell them to different traders. Crafting is not very beneficial in terms of making money. Essentially the economy is based on your interactions with NPCs. The economy of TES Online differs greatly as it is based on players’ interaction. You can sell the goods you find through your adventures to other players, and buy items from your guild store or public stores in Cyrodiil. Crafting also plays a very important part in the economy as it allows the creation of high end equipment to those that take the time to master it. 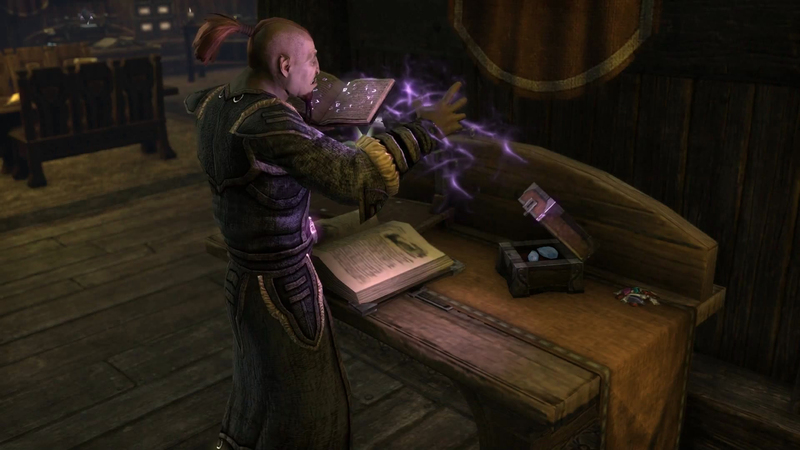 We can be sure to expect some very powerful items from Crafters, Enchanters and Alchemists. Both games are based on a very clear and interesting progression system. You level up the skills, armor, weapon etc. as you use them. If your primary weapon is a Two-Handed sword you will level up the Two-Handed skill line. In the same way, you can become a master of a specific skill path if you use spells from this path while playing. As Skyrim is a single player RPG and ESO an MMO the combat systems will differ to account for the stresses of online gameplay. The biggest difference in combat is that Skyrim allows you to use any skill you have whenever you want. You can use different shouts and magic in any combinations. This is because it is possible to pause the game at any time and pick up a skill you need or drink a potion. But, ESO does not allow such tricks. As an MMO all fights are in real time. Instead ESO allows you to have 6 skills on your hotbar simultaneously and you can use these 6 skills. You can switch between 2 hotbars as you switch weapons, but, you have no access to all abilities in combat. But don’t fear Skyrim fans will find a lot of familiar things in ESO combat system. The two games are developed by different companies. The author of all single player TES series is Bethesda Softworks, but, ESO is developed by ZeniMax Online Studios. Some TES fans are disappointed with this fact but they probably don’t know that both companies belong to the same owner: ZeniMax Media Inc. We can call Bethesda and ZeniMax Online sisters. But what was the reason for creating a new company? 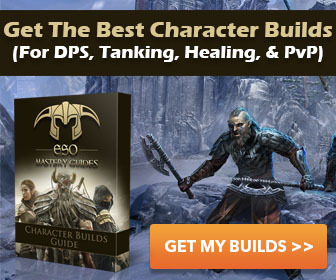 Elder Scrolls Online is an MMO game and this requires other specialists and other knowledge. About half of the developers’ work is closely connected with creating and maintaining technical infrastructure. The team created Megaserver technology that will provide players with an absolutely new game experience. MMO games also require huge a support department and a team that will provide players with regular updates. Elder Scrolls Online is bigger than any other TES game and that’s why they decided to create a new company for developing ESO. I love Skyrim. I have well over 2300 hours of playtime, from day one when it was first released. In addition, I have never ever played a vanilla version of Skyrim from day one either. Currently I have over 60 mods installed in the game. That is one reason why I steer away from MMORPG games and those dreaded consoles. I have only been involved with the Elder Scrolls games since Oblivion and Skyrim, so the notion that ESO may or may not be lore friendly matters little to me. That all said, I am more than willing to give ESO a chance.